In 1892, when the theater district was slowly moving northward from West 23rd Street, Al Hayman and Frank Sanger planned a daring project. Their theater for stock companies would be 25 blocks uptown on Broadway, just off the corner of 40th Street, where only a handful of theaters had tested the waters. Hayman was confident that the neighborhood was the up-and-coming entertainment district. Across the street was the Metropolitan Opera House which had opened nine years earlier. The speculators hired the architectural firm of J. B. McElfatrick & Son to design the structure, which was completed in January 1893. The impressive new theater cost $500,000 to build. Five stories tall, it featured an immense arched double-height entranceway. The two lower floors were constructed of Indiana limestone. Paired Corinthian columns flanked the two large arched windows of the second floor, while the buff-colored brick-faced upper stories were much more restrained. A brick and stone balustrade capped the uppermost cornice. The lobby had black marble walls and etched glass doors. To the left of the entrance was the ladies’ alcove with an Empire-style mahogany fireplace that rose 18 feet high and “comfortable seats.” The glass ceiling, 35 feet above the ladie’s foyer, was back-lit by 150 electric lights. A marble staircase lead down to the smoking room which was outfitted with library furniture. The crimson-and-gold themed auditorium seated around 1,200 patrons. 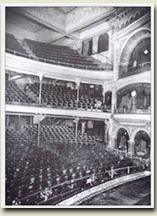 Charles Frohman, along with his partner William Harris, leased the theater which opened on January 25, 1893 with the debut performance of David Belasco’s “The Girl I left Behind Me.” The show was a hit and ran for 288 consecutive performances and grossed an amazing $8,800 in ticket sales during its best week. It was an important step in the development of Broadway as New York’s premier theater district. Frohman continued to introduce the works of the leading playwrights of the day. On February 15, 1894 Ibsen’s “A Doll’s House” was introduced and in August “Charley’s Aunt was first staged. In the Fall of that year the cost of tickets for downstairs seating was raised to a seemingly exorbitant $2 each. The Empire also ran an acting school and the students were regularly part of the cast. On November 8, 1897 popular actor John Drew joined the cast of “A Marriage of Convenience,” by Sydney Grundy. It would be a long-term relationship for both the actor and the theater. On those occasions when Drew was ill or unable to perform, the theater was closed rather than using a stand-in. Audiences did not come to the Empire to see someone else play Drew’s parts. John Drew would be the main star attraction at the Empire for another twenty years. Maude Adams, one of the 19th century’s equivalents of today’s screen celebrities, often appeared at the Empire. But it was her creation of the role of Peter Pan in 1907 that theater goers would probably most remember at the Empire. In 1915 Charles Frohman perished on the RMS Lusitania and Al Hayman took over the reins. Hayman died two years later and his estate ran the theater. Finally in 1931,in order to close his estate, the courts ordered the sale of the theater. Within the next few decades, the Empire would be the venue for inventive theater. Here, on December 7, 1925, Noel Coward’s “Easy Virtue” opened. Gertrude Stein’s all-black cast opera “Four Saints in Three Acts” premiered on April 2, 1934 and three years later George Bernard Shaw’s “Candida” was staged. One of the Empire’s greatest hits opened in 1939 with the production of “Life with Father.” The highly-popular play ran for six consecutive years. 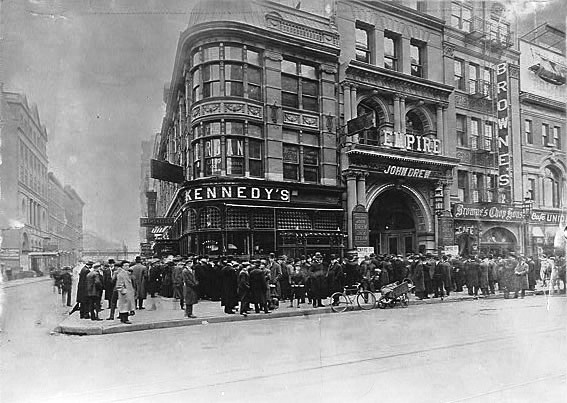 In 1946 32-year old Jacob Freidus bought the venerable Empire Theatre for $1 million. Three years later, on January 4, 1949, Freidus sold the property to the Astor Estate. It was the beginning of the end for the historic theater. Actress Shirley Booth was preparing to appear in “The Time of the Cuckoo” in early Fall 1952 when the announcement was made that the theater would be destroyed to make room for a modern office building. It was not just the audiences and actors who would lose a revered playhouse; Clara Borback had been head usher for 26 years, Alberta Ryland was matron of the ladies’ room for three decades and her husband, John Ryland worked there as superintendent for forty years. On January 25, 1953, five months before the wrecking ball was scheduled to arrive, a celebration was held for the Empire’s 60th birthday. On May 22, 56 leading performers gathered on stage for a farewell salute. The actors performed scenes from plays that were staged there over the past 60 years. A who’s-who of the American stage appeared: Brandon de Wilde, Basil Rathbone, Maureen Stapleton, Ethel Waters, Shirley Booth, Ethel Barrymore and Mary Boland among them. 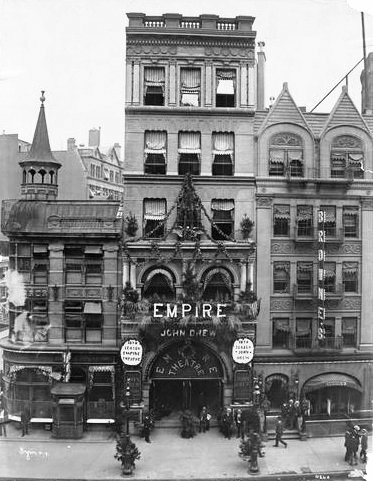 Nearly half a century before wide-spread historic preservation efforts that may have saved it, the Empire Theatre was demolished and an important piece of Broadway history obliterated. ﻿In 1863 Cardinal McCloskey purchased the plot of land at the northeast corner of 2nd Avenue and 105th Street on which he intended to build a new church. As more and more urban pioneers ventured to the northern end of Manhattan, this Harlem neighborhood was in need of another Catholic parish. Nevertheless, the priest had a wooden church erected on the land the Cardinal had purchased earlier. 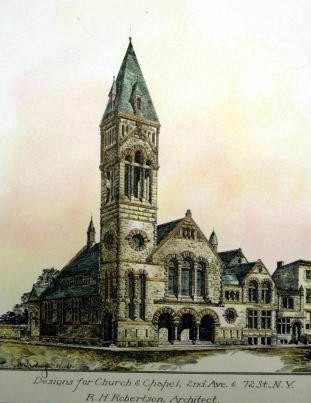 On August 230, 1873 the new building, built at a cost of $10,000, was dedicated. The little building served the growing parish for six years until Fr. Flattery resigned. His successor, Rev. William Flannelly, recognized the need for a more spacious structure and in March 1881 purchased four lots on East 106th Street from Addison and Mary Brown. The residential-sized lots cost the church $25,800; about $565,000 today. Architects Napoleon Le Brun & Sons were commissioned to design the new structure. Having moved to New York from Philadelphia around 1861, Le Brun busied himself not only with designing several other churches but with the fire houses of the New York Fire Department for which he was official architect. Progress on the new church, however, crept along. The cornerstone was not laid until September 1883. In an unusual agreement with the pastor, Rev. Michael J. Phelan, (Father Flannelly had unexpectedly died in 1884), Le Brun & Sons drafted the overall designs and ornamental details and laid out the specifications for the construction; however the architects were not to be involved in the construction. Father Phelan, who would earn the nickname “The Builder of Churches,” insisted on acting as general contractor. He personally contracted the bricklayers, plasterers, carpenters and other builders and oversaw the project. Phelan’s extraordinary ability to handle complex building projects reduced the cost substantially. Once the basement of the new structure was completed, services were held there until the upper church was finished in 1887. 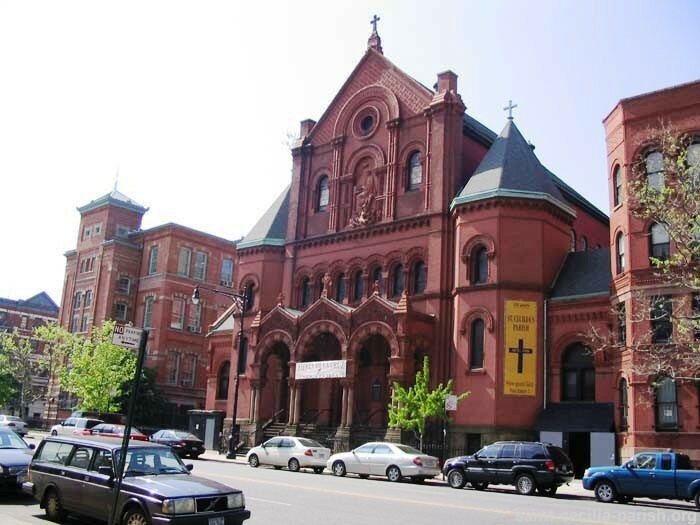 The original frame church had been donated to the parish of the Holy Rosary and was moved to East 119th Street. The completed church, costing $150,000, is a Romanesque Revival style basilica of textured brick with terra cotta accents. A projecting, triple-arched portico with ten granite columns extends to the sidewalk , above which are seven stained glass windows. Above, is an enormous terra cotta high-relief sculpture of St. Cecilia (the patron saint of music) playing the organ. As the New York subway extended into Harlem in 1900, accessibility to the neighborhood was greatly simplified. By 1914 the parish listed 6000 members and the complex included the church, rectory, a school and convent. ﻿In 1939 the Redemptionist Fathers took over administration of the church and its facilities who continue to staff it. 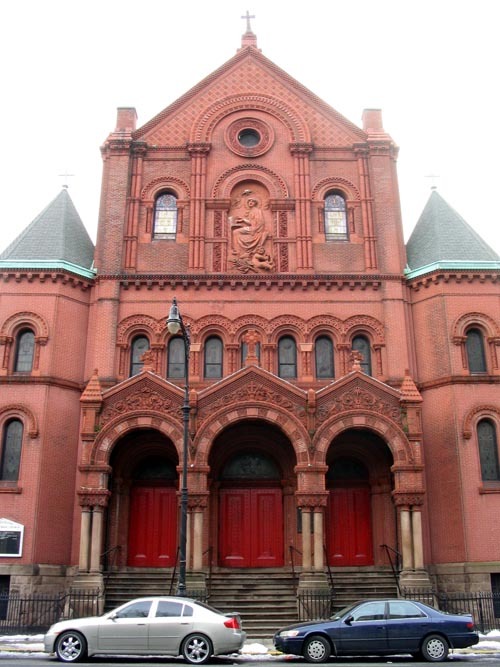 The parish has maintained the building, which was landmarked in 1976, in exceptional condition and Napoleon Le Brun’s exuberant brick and terra cotta church looks much as it did when Archbishop Corrigan dedicated it on November 27, 1887. In 1872 the somewhat eccentric James Gordon Bennett, Jr. was internationally-known as the publisher of the New York Herald; a reputation that had been greatly enhanced a year earlier when he sent reporter Henry M. Stanley into Africa in search of Dr. David Livingstone. His far-reaching and innovative improvements in the newspaper industry made him a fortune – estimates were that he had made over $30 million before his death thirty-one years later in 1913. 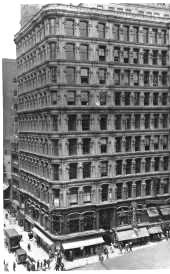 Bennett purchased the large plot of land covering the Fulton Street block front from Ann to Nassau Streets and commissioned Arthur D. Gilman to design a large, modern office building for the site. Construction began in 1872 and was completed a year later. Six stories tall, Gilman’s resulting Bennett Building was a cast iron beauty. The architect used the versatile material at the height of its popularity to create an ornate Second Empire structure with a repeating pattern of windows, columns and cornices at each level. Gilman gently wrapped the corners with a distinguishing curve and topped the whole with a fashionable mansard roof. Around the time that Bennett was co-founding the international telegraph firm, Commercial Cable Company, in 1893, a drug store owner was just testing the waters of downtown real estate. Although John Pettit had little capital, he recognized the potential of run-down older buildings. Buying small buildings on side streets for little money, he invested in paint, new flooring and doors. Once they were again rentable, he would sell the properties for a small profit. After a decade of practice, Pettit was ready for his biggest step yet: he would purchase and renovate the cast iron building that bore James Gordon Bennett’s name. In its September 1890 issue the printing industry journal Inland Printer reported on the sale, giving the price paid by Pettit as $1 million. The New York Times estimated the cost at more like $625,000, a figure the newspaper said was “about $200,000 less than its value.” Like all of the buildings Pettit bought, the Bennett Building had seen better days. As always, Pettit went about making improvements. He abhorred structural ornamentation saying it “did not add a dollar to the rent, but did increase the amount of investment.” To this end, he kept an in-house architect and acted as his own contractor. Yet for the Bennett Building he strayed from his philosophy. Architect James M. Farnsworth was instructed to enlarge the building and make it competitive with newer office buildings. He stripped off the mansard roof and added four floors in seamless imitation of Gilman’s original design; a remarkable example of sympathetic treatment of existing architecture for the time. Inside “swift-running” elevators were installed and the interiors were totally renovated. Pettit’s renovations cost $200,000; but a second mortgage of $300,000 prevented his spending a dollar of his own money. With the alterations complete Pettit put the building on the market and in May 1894 a sale was announced. Pettit released the news that Theodore A. Havemeyer purchased the Bennett Building for $1.5 million. The profitable deal fell through, however, and Pettit remained the owner until 1898 when things began getting uncomfortable for the real estate manipulator. With a law suit against him and buildings falling into receivership, John Pettit was gone. In June he left his magnificent estate in East Orange, New Jersey, never to be heard of again. Two months later, in his absence, the Pettit Realty Company sold the Bennett Building to H. B. Sire for about $1.5 million. 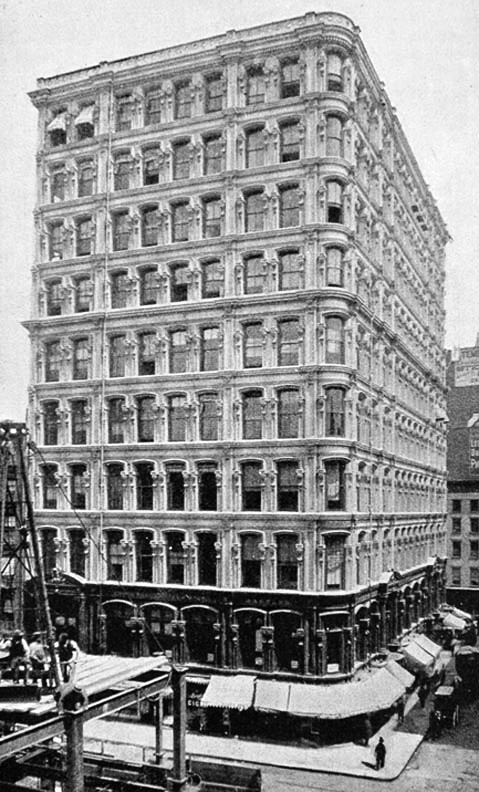 The building was in trouble again in 1904 when it was sold under foreclosure to the New York Life Insurance Company for $907,000. “There was practically no competition for the property yesterday and the auction was apparently nothing more than a formality for getting rid of this old mortgage,” reported The Times on April 12. The insurance company held the building for two years before selling it to Philadelphia businessman Felix Isman for $1 million; essentially the same price Pettit had paid for it more than a decade earlier. Isman had been actively purchasing and developing Manhattan real estate for about four years. Later that year his new acquisition caused Isman a headache when Water Register Michael C. Padden discovered an unmetered water pipe in the basement. The City Controller’s Office sent a bill for $2,550 to cover 17 years of unpaid water usage at $150 a year. Isman refused to pay. The unmetered water pipe was ripped out, upsetting the flow of water to parts of the building. One tenant, in particular, was displeased. Isman struck a compromise with the city and a meter was installed on the reinstalled pipe. Throughout the first half of the 20th century the Bennett Building was used not only for stores and offices, but for small manufacturing. During most of this time it was owned by George B. Wilson and, later, his family. In 1949 it was purchased by Jackadel Associates who brought the structure up to code by moving the south entrance on Nassau Street to sidewalk level, closing the Nassau street entrance and relocating the Ann Street entrance to street level. In January 1951 it was sold to Harry Shekter of the Dorlen Realty Company who retained ownership for three decades. After taking control of the property in 1983 Haddad & Sons Ltd. Renovated the exterior by replacing the windows of the second floor and adding new storefronts on Fulton and Nassau Streets. It was sold again in 1995 to ENT International in 1995, the year it obtained landmark status. As the 19th century drew to a close and the city’s poor crowded into cramped tenements, the problem of bathing was increasingly serious. 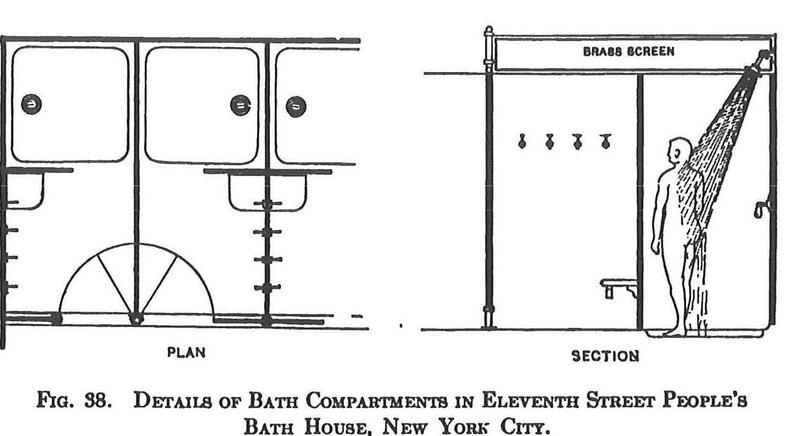 In the Lower East Side in 1896 there was one bathtub for every 79 families. Half a century earlier the public had demanded action by the city. By the time of the Civil War middle- and upper-class families in New York had begun bathing regularly, as the Europeans did. But the lower classes had no means to bathe. By 1858 the Committee for Free Public Baths had been formed, but nothing would be done about the situation for decades. Even after the New York Senate passed a law on April 21, 1895 requiring that all first and second class cities create free public bathing facilities, Manhattan’s first bath did not open until 1901; governmental red tape miring the process. Following the opening of the Rivington Street baths on the Lower East Side in 1901, the project gained momentum. In 1903 the City bought two lots at 538-540 East 11th Street in the Tomkins Square neighborhood which was populated mainly by German immigrants. 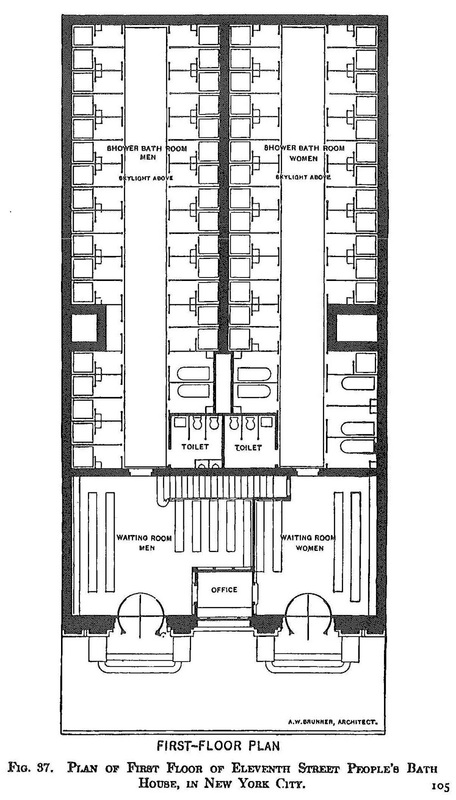 Architect Arnold Brunner was commissioned to design a public baths. Construction was completed in 1905. The first years of the 20th century were marked by the City Beautiful Movement. The philosophy behind it was that imposing, monumental structures would inspire citizens to behave consistently with their surroundings. Brunner’s baths would follow that viewpoint—a gleaming white Italian Renaissance structure with splashes of Beaux Arts ornamentation. Situated among the dark brown brick tenement buildings, it shimmered like a pearl. The building, constructed of Indiana limestone, cost the city $102,989. 1 * People’s baths houses should look and be clean, feel warm, smell sweet and be quiet and orderly. 2. * Bathing is a means of safeguarding the public welfare by the prevention of disease and by the raising of the standard of personal cleanliness and morality. * By the maintenance of free public baths universal bathing is more nearly and most economically accomplished. The 11th Street Baths followed these principals. There were two separate entrances; one for males and one for females. No proper Victorian would have mixed the sexes even in the lobby. There were 94 rain baths (today called “showers”), 67 for men and 27 for the women; and seven bathtubs, two for men and 5 for women. Bathers would bring their own towels and soap. Privacy was an important factor and each stall had its own changing room. Each person was allowed 20 minutes to bathe. The first summer after the baths opened was insufferably hot. On the last day of June 1906 14 people died of the heat and The New York Times reported “it was the hottest June since 1901.” The indigent poor in the Tompkins Square neighborhood suffered. The newspaper noted “The east side, which has always been the worst sufferer in hot waves, again supplied the biggest number of heat cases yesterday.” To escape the heat people sought the cooling waters of the Public Baths. Despite the newspaper’s optimistic attitude, it was obvious to the city that the poor were using the public baths to keep cool rather than clean. Patronage fell sharply off during the winter months. Gradually, private bathrooms were installed even in the tenement houses and the need for the free public baths eroded. By the middle of the century, only three public baths were in operation in the city, one of which was East 11th Street. Although in 1958 131,000 persons used the three baths, the city closed the 11th Street and 109th Street baths in money-saving move. Brunner’s miniature limestone palazzo sat neglected for three years, then it was sold in 1961 and converted into a parking garage. The steps into the arched men’s and women’s entrances were removed and ramps installed to enable cars to drive in. As the neighborhood declined in the next decade, with Tompkins Square park becoming a notorious drug center, the baths building became a warehouse. Pulitzer Prize-winning photojournalist Eddie Adams and his wife Alyssa purchased the building in 1995. It was converted into a photography studio, the grimy façade cleaned and replacement gates to the arched entrances installed. Despite the abuse suffered by the 11th Street Public Baths in the last half of the 20th century, it emerged as “a highly intact example” of Arnold Brunner’s work, as described by the Landmark Preservation Commission. It is an attractive reminder of a time in New York City when the simply task of taking a bath was difficult for many. The romantic and sometimes whimsical Queen Anne style of architecture—with its gables and turrets, stained glass windows and eccentric mixture of materials and colors—made its debut in New York City with Sidney V. Stratton’s New York House and School of Industry in 1878. It would soon become a frenzied fad on the cutting-edge of architectural fashion. Architect Bruce Price would be among the first New York architects to test the new style. In 1881, a year after he married Elizabeth Lee, Dr. William J. Morton commissioned Price to design a town house at 36 West 56th Street, just west of the most fashionable residential thoroughfare in New York: Fifth Avenue. Morton was the son of another esteemed physician. A scandal over the elder Morton’s possibly questionable claim to have discovered surgical anesthesia resulted in his reputation being blighted. The editor of the Southern Medical Journal said that “an unprejudiced committee would find that Morton was an imposter and a mercenary promoter.” William J. Morton would spend the rest of his life bitter and resentful over his father’s treatment by the medical community. Morton’s home was finished in 1882; a five-story up-to-date structure with all the bells and whistles necessary for an urban Queen Anne building. The first floor, where Dr. Morton’s offices were housed, were clad in rough-cut stone, accessed by a shallow flight of steps from the sidewalk. The second and third floors featured an oriel window that formed a stone balcony with a quirky iron railing at the sun-washed fourth floor. Terra cotta tiles, brick, small paned windows, and stone melded to create an eye-catching and romantic house. The American Architect and Building News got the address wrong, but provided a colorful sketch of the house in its December 17, 1887 issue. Because the doctor’s offices were on the first floor, the kitchen was located on the top floor; a highly-unusual arrangement in residential layouts. A dumbwaiter carried the hot food to the dining room. The busy Dr. Morton was the editor of the Journal of Nervous and Mental Diseases and was on the forefront of 19th century medicine. He was highly involved in the experimental use of electrotherapy and x-rays. The 1896 book “The X-ray; or, Photography of the Invisible and its Value in Surgery” called William J. Morton “the best X Ray expert in the United States.” Dr. Morton wrote the book so the acclaim could be a bit biased. By the time that book was published, however, the Mortons had moved out. Civil War hero Major General Daniel Butterfield and his wife, the former Julia Lorillard, were living here in April 22, 1890 when the house caught fire. General Butterfield left his mark on the military not only by his outstanding service during the war, but by composing the bugler’s Taps. On that night, an overheated range caused a blaze that resulted in about $400 damage. The Butterfields moved on to 616 5th Avenue by the turn of the century, selling No. 36 West 56th to Annie Barnes Kellogg, the wealthy widow of Ansel Nash Kellogg. Kellogg had founded the Kellogg Newspaper Company of Chicago and originated the “plate matter” for country newspapers. It was possibly Annie Kellogg who commissioned the sensitive renovation to the fifth floor—changing the double-window to a series of four side-by-side windows and reducing the triangular framing to a small pediment along the roof line. The “man much younger” was Alfred Grenwood Dale, the assistant manager of the Grand Central branch of the Corn Exchange Bank. “Mr. Dale is twenty-five years younger than his bride,” remarked The Times. By 1912 little remained of Millionaires Row on Fifth Avenue in the 50s as wealthy New Yorkers built mansions farther up along the Park to escape encroaching commercial interests. It may be that Annie’s marriage to the young Alfred Dale did not last, because when she sold No. 36 that year she was using the name Kellogg. The house had been valued a year earlier at $93,000. By the time of Prohibition, West 56th Street was no longer residential and had become a bit shoddy. In 1933 Dr. Morton’s once-elegant mansion was converted to a restaurant. Plans filed with the Department of Buildings describe the restaurant on the first two floors, “private dining room” on the third and offices and store rooms above. The restaurant, however, was in truth the Mona Lisa Club, a high-end speakeasy that, despite its elite patrons was not immune to occasional police raids. The Mona Lisa Club went the way of Prohibition and in 1936 there was a store on the first floor and three apartments on each floor above. The Mi Chou Gallery, an Asian art gallery, was here from 1958 to 1960 and the building continued its mixed-use through the end of the century. At some point a bizarre-looking street-level addition obliterated the first floor and eradicated the entrance stairs. But above the brutal addition, Bruce Price’s extraordinary Queen Anne design is remarkably intact. 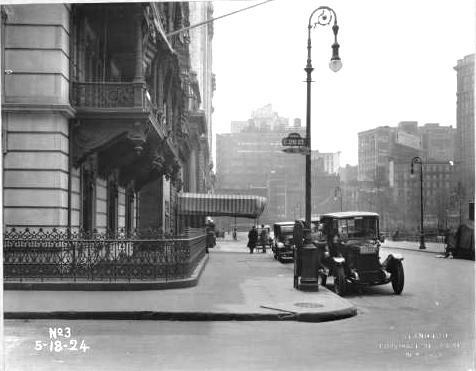 On April 21, 1931 a solid silver casket which the undertaker said had cost $15,000 was removed from the penthouse home of Giuseppe Masseria at 15 West 81st Street. Sixteen automobiles were necessary to transport the floral tributes and 69 cars followed the hearse in the funeral cortege. The shining black cars moved through Manhattan from the ritzy Central Park neighborhood to the humble streets of the East Village and the Italian church of Mary, Help of Christians. Masseria was best known as “Joe the Boss,” an underworld kingpin who had been shot down in Coney Island a few days earlier. Undercover detectives mixed in with the mourners inside the church. Three priests celebrated a solemn requiem mass in the sanctuary laden with flowers – most of which were from anonymous donors. One exception was a heart of roses with a silk ribbon bearing the initials A. C. It was from Alphonse Capone. The church was not an overly-ornate one, nor was it a high-profile, important church among the New York Roman Catholic parishes. It was however, integral to the Italian community. As the turn of the century approached, the Lower East Side was filling with Italian immigrants. In 1898 Archbishop Corrigan, cognizant of the need for increased spiritual guidance for the Italians, invited three Salesian Fathers from Italy to come to New York. Initially they took charge of St. Brigid’s Parish. But by 1906 the burgeoning Italian population required an additional parish. Two houses on East 12th street were purchased; one to be used as a rectory and Sunday school, the other as a chapel. On July 8, 1908 the mission was elevated to the parish of Mary, Help of Christians. A new church was now necessary in the midst of the Italian community. The Catholic Church already owned land in the area. It was the Roman Cemetery of the old St. Patrick’s Cathedral. Among the 41,016 graves here was, oddly enough, that of Lorenzo da Ponte, Mozart’s librettist who was responsible for “Don Giavanni,” “Cosi fan Tutte” and “The Marriage of Figaro.” Da Ponte had come to the United States in 1805, fleeing debtors, and was buried here on August 20, 1838. The coffins in the Roman Cemetery were exhumed in 1909 and reburied in Calvary Cemetery. There was now land for the new church. In 1910 the basement was excavated. Six masses were celebrated here every Sunday and one in the chapel. Plans for the new church were filed by Domenico Briganti in 1911. It would be a Florentine-inspired structure, nearly flat-faced, with two short towers on either end capped by domes. Four shallow Corinthian pilasters would separate the three arched entrances and support a classical closed pediment. Despite the enormous number of Italians being served by Mary, Help of Christians—according to the 1914 “The Catholic Church in the United States of America” there were 20,000 congregation members (“mostly Sicilians”)--it would not be until six years later, at 4:00 in the afternoon on July 15, 1917, that the cornerstone was laid for the new structure. Mgr. Michael J. Lavelle, rector of St. Patrick’s Cathedral, officiated the ceremonies. The church was always much more than merely the movie-like scene of gangster funerals. It was the spiritual home to a multitude of pious immigrant families. On the feast day of Mary, Help of Christians in 1933, “several thousand residents of the east side Italian colony participated in ceremonies,” as reported in the newspapers. On March 19, 1935 the parish had a scare when the church caught fire during mass. Most of the worshipers were women and many had knelt before the altar of the St. Joseph’s Chapel prior to services to light candles. Father Peter Pelegrino was serving communion later to 50 persons and the heads of the other parishioners were bowed in prayer. No one noticed the lit candle fall from its holder in the chapel. By the time sexton Jack Gulino noticed the blaze, it had engulfed the tapestries and embroidered altar cloths. The flames caught the wax flowers that wound around a five-foot wooden arch that framed the statue of St. Joseph. The flammable wax melted and spread the flames fifteen feet upward. While Gulino and ushers attempted to beat the flames with their bare hands, the pastor, Father Paul Zolin instructed the women in their pews to remain calm. The priest then helped pry the wooden frame loose. Gulino and the ushers hauled the flaming arch to a backroom to stamp it out. The statue of St. Joseph crashed to the floor and smashed. Father Zolin again instructed the 200 women who were clustered around the chapel to return to their pews. Services continued outside. One of the interesting congregants of Mary, Help of Christians was “Mr. Valentine.” His profession was collecting sounds for photograph records, Broadway shows, motion pictures and such. When Lord & Taylor Department Store needed church chimes for their Christmas window display in 1940, Mr. Valentine obliged. “I could have used Trinity or one of the big churches, but I’m loyal to my own parish. The Lord & Taylor bells you heard were the chimes from Mary, Help of Christians Church on Twelfth Street,” he told a reporter. By mid-century the Italian population was thinning out in the 12th Street area. The four-story convent on East 11th Street, no longer necessary, was converted into apartments. But it was not the end of the line for the church. Not yet. In 1953 Sara Delano Roosevelt, granddaughter of the late President Franklin D. Roosevelt was married. She had fallen in love with Anthony di Bonaventura, the son of a 17th Street Italian barber. The couple chose not to be married in a society church, but in di Boneventura’s family parish of Mary, Help of Christians. Although the ceremony was small with only a few friends and relatives invited, East 12th Street was crowded with over 2,000 people from the tenement buildings who longed to get a glimpse of the unlikely couple. By the 1970s the neighborhood, never an upscale one, saw an increase in crime. The church was broken into three times within three months in 1973, the thieves taking the money from the poor boxes. The neighborhood was also luring artists and poets. In his “May Days 1988,” poet Allen Ginsburg described his view of Mary, Help of Christians from the window of his tenement apartment across the street. Josephine Ruta and her sister Margaret, doubtlessly disagreed. The women had lived in the same tenement building for over 80 years and had known only one church: Mary Help of Christians. But the "lifecycle" of the church had run its course and on May 20, 2007 the last mass was celebrated. The lights were extinguished and the doors locked. Inside, where Mafia funerals and a Roosevelt wedding had taken place, dust settles on the altar and pews. The church sat vacant for six years. Then early in 2013 the property was purchased by developer Douglas Steiner of Steiner Studios as the site of a luxury residential and retail structure. Concerned local residents and preservationists appealed to the New York City Landmarks Preservation Commission to intercede. Despite the historic significance of the church, the 150-year old rectory and the 90-year old school building, the Commission declined. The developer, simultaneously, refused to consider recycling of the venerable structures. Andrew Berman, Executive Director of the Greenwich Village Society for Historic Preservation pointed out "A smart developer would recognize that by preserving and re-using these historic buildings and b uilding on the large adjacent yard, he would not only be doing a good deed, but creating an infinitely more unique and valuable development than simply bulldozing the entire site and starting anew." In May 2013, even as demonstrators rallied outside the church steps urging its preservation, another historic fragment was uncovered in plain sight. An ancient stone wall, typical of those the protected early New York burial grounds runs between West 11th and West 12th Street; quite possibly the surviving wall of the old Roman Cemetery that predated the church. It is yet another historic structure that would be erased by the planned development. Although the dignified façade of Mary, Help of Christians, looks as fresh and maintained as it did a century ago, its future is uncertain. Even in a time of improved architectural and historic appreciation, this integral page in the history of the Italian community in Manhattan may soon be obliterated. The feisty and flamboyant Leonard Walter Jerome was born on a farm near Syracuse, New York in 1817; a drastically different environment from the one he would later become accustomed to. After practicing law in Rochester for a period, he moved to New York City where he speculated in stocks. Jerome earned the title “The King of Wall Street” after making and losing fortunes in the market. He increased his fortune by investing in several railroad companies and newspapers and by the age of 40 was among the wealthiest men in New York. In 1859 Madison Square Park was lined with elegant mansions of the well-to-do. Jerome commissioned the British-born architect Thomas R. Jackson to design the largest and most opulent residence in the city. Situated at the corner of Madison Avenue and 26th Street, it would be like nothing New York society had ever seen. The Paris Exposition opened seven years earlier, sparking a craze for the French Second Empire style of architecture. Jackson drew on the new style, putting the Jerome mansion on the cutting edge of architectural fashion. While the millionaires of Fifth Avenue were building staid brownstone residences, the Jerome mansion erupted with flair. Six stories tall and costing $200,000, it featured a high slate-shingled mansard roof above two stories of brick and contrasting stone. The first and second floors were composed of rusticated limestone. A stone portico supported by four columns formed a balcony with a carved stone balustrade at the second floor. Two elegant balconies on the Madison Avenue side extended the width of the façade. The stables, separated from the house by a small lot, were built to match the mansion, including stained glass windows—extremely ritzy accommodations for Jerome’s horses. In a somewhat unusual arrangement, the ballroom was originally installed in the second floor of the stables. Late in 1866 or early 1867 Jerome had a private theater built in the space between the mansion and stables. Leonard and Clara had three daughters, Jennie, Clarita and Leonie. All three would later marry British suitors; but it was Jennie who would become Lady Randolph Churchill, the mother of Winston Churchill. The first floor was dedicated to reception areas, a reading room, art gallery, billiard room, a bar and “the ten-pin alleys.” The second floor had a lecture and meeting room and private dining rooms. The main parlor was on the third floor with paintings of important Americans and Cropsey’s painting of “The Field of Gettysburg.” Here too was the library and trophy room. The Club spent $50,000 in renovating the mansion. 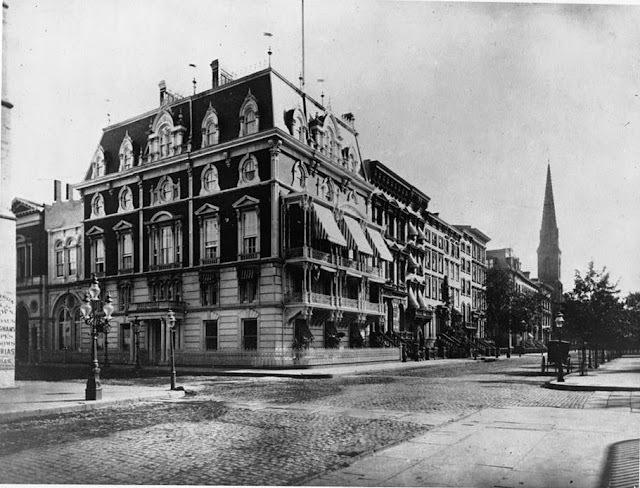 The Club commissioned architect J. Morgan Slade in 1875 to remove the mansard roof and add a seventh floor. The Department of Buildings approved the plans, which called for a flat tin roof with galvanized iron cornices and gutters; however the changes were never implemented. When the Union League Club moved out, the house was leased to the University Club in 1883 which began its own alterations. The theater was renovated into the “New Dining Room” by Charles C. Haight and in 1889 McKim, Mead & White did some interior renovations. 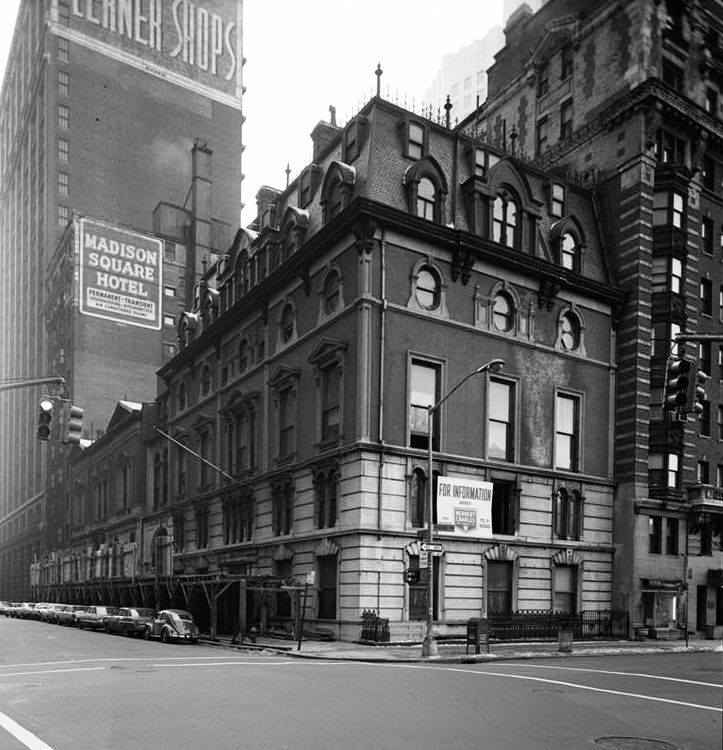 In 1899 the University Club moved into its new Italian palazzo on Fifth Avenue. 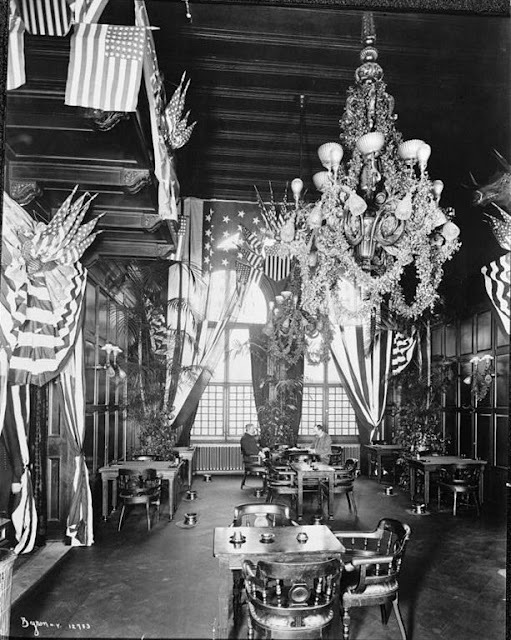 The Manhattan Club, which had been using the A. T. Stewart mansion on Fifth Avenue as its clubhouse, took over the Jerome Mansion. Over the decades political fortunes were made and lost in the Squirrel Room on the sixth floor. Among the politicians who gathered here were Grover Cleveland, Franklin D. Roosevelt, James Walker, Robert F. Wagner, Sr. and Alfred E. Smith. It was in the bar of the Manhattan Club that the cocktail bearing the club’s name was invented. Two years after the Landmarks Preservation Commission termed the Jerome Mansion “priceless” it was bulldozed to the ground. In its place a glass and steel 42-floor skyscraper, the New York Merchandise Mart, was completed in 1974. In March 1887, the Knox Presbyterian Church moved into its new chapel and Sunday school room. The new congregation – only two years old at the time – was moving swiftly to erect a formidable church building at the corner of 72nd Street and 2nd Avenue and the new chapel was the first completed step. The group intended to make a splash with its projected church structure. It commissioned the highly-popular architect Robert Henderson Robertson to design the building and spent $65,000 for the valuable corner lot. Robertson was widely-known for his Romanesque Revival works which were currently all the rage. Robertson’s sketches laid out a complex of connected buildings with a delightful jumble of roof peaks and angles. 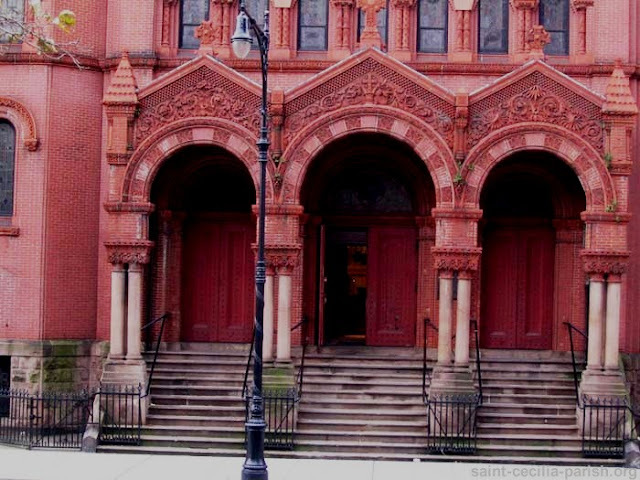 Heavy stone arches of rough-cut brownstone would be supported by polished granite columns and an eye-catching 125-foot bell tower would dominate the corner. A handsome roof of “red Akron tiles,” would cover the entire complex, as reported in The Real Estate Record and Guide. 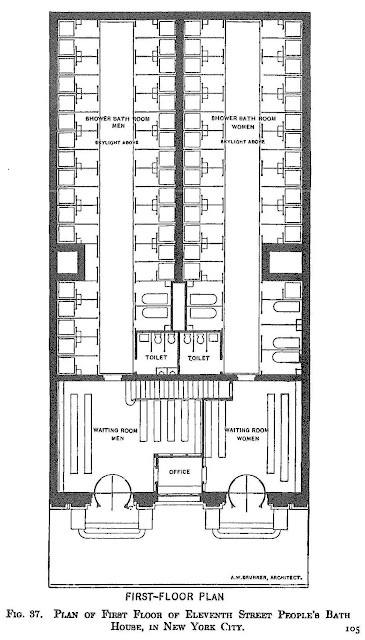 The completed chapel and classroom building was finished at a cost of $25,000, not counting the $40,000 lot, and was, as The New York Times reported on the day after opening, “paid for.” In addition to the chapel area, there was a lecture room, library, and class rooms; all “furnished in hard wood and well arranged.” The little chapel could comfortably seat only around 700 worshipers. For some unknown reason, the arrangement of the chapel and Sunday school building were flipped from Robertson’s original sketch – like a reversed photo negative. Another year passed and on March 10, 1889 the Rev. Dr. David G. Wylie, pastor of Knox Presbyterian, praised his congregation for their work and reminded them of their growing numbers which now amounted to 300 members. “The Pastor made a strong appeal for a new church edifice,” said The Times. A substantial number of influential congregants resigned and the new church building which once seemed so close to realization was again tabled. 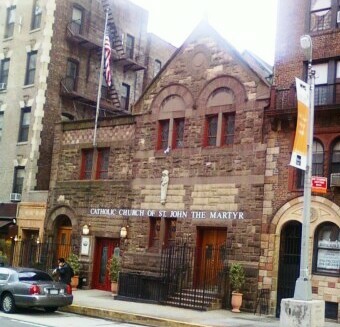 The church was finally sold in 1904 for $39,000 to the newly established St. John the Martyr’s Bohemian Catholic church. 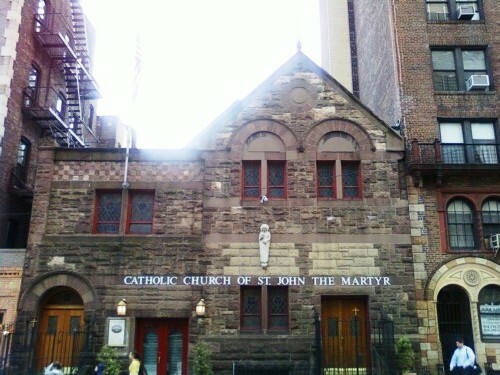 The parish had been established in 1903 and had been worshiping in a house on East 71st Street purchased by Archbishop John Cardinal Farley. The neighborhood had earned the nickname “Little Bohemia” by now as middle-European immigrants settled in the area. In celebration of its new home the church received impressive gifts. The Maschek von Masburg family donated a set of 10 bells; a painting, “St. John Nepomucine,” by Alphonse Mucha was valued at $50,000; another, “Three Martyrs,” by Zimmerman was priced at $40,000. Another painting, “Mary Magdalen,” by Albert Marx had won first prize at the Vienna Exposition of 1875 and was on its way from Prague and cost the donor $100,000. Also given to the church were more than 60 holy relics donated by priest who had obtained them from “a noble family in Rome.” The supposedly miraculous objects were said to include a fragment of the cloak worn by St. Joseph; pieces of bone from 55 saints including St. Stephen the Martyr, St. Patrick, St. Anthony and St. John the Baptist; a piece of the true cross; small splinters of the table from the Last Supper; parts of the sepulcher in which Christ was laid; and a piece of the rope from the scourging of Christ. Scandal ensued when the relics, some of which were housed in gold cases, were loaned by Father Prout to Msr. Lavelle in 1911. The relics were reported to have been the cause of “some wonderful cures” in January of that year. “Sores were healed, swellings reduced, deformed limbs made normal, and weak eyes made strong, and so the people set great store by them and came to the church in large numbers to worship while they were there,” said The Times. Despite the loss of the valued relics, the parish continued. In 1913 there were 408 baptisms and 165 weddings. On January 29, 1949 an unlikely and potentially tragic event unfolded while 37-year old Rev. Vincent J. Campbell was hearing confessions. As about 20 parishioners waiting in the pews for their turn, a man suddenly stood and drew a rifle from a paper covering and shot through the confessional booth. Robertson's chapel and parish house, with their rough-cut brownstone blocks, are flipped from the original designs. Little Bohemia is no longer. As with most ethnic neighborhoods of Manhattan, the concentration of Bohemian residents has been diluted as new generations move on. But St. John the Martyr’s Church still survives strongly in the chapel of the grand church that was never to be. Quite different from the straight, wide thoroughfares of Midtown that intersect at crisp right angles are the narrow, twisting streets and alleys of the Financial District. Here at the southern tip of the island the Dutch first settled and these venerable roadways follow those early designs. The confusing tangle sometimes results in historic, architectural gems being hidden and overlooked. Gems like No. 103 Washington Street. Two centuries ago, around 1812, a three-story Federal style building was constructed here. Washington Street, at the time, was blocks away from the bustling commercial center on the other side of Wall Street. In the 1780s, landfill widened Manhattan and Greenwich and Washington Streets were created in 1797. By 1812 houses and shops catering to the ships docked nearby lined the street. 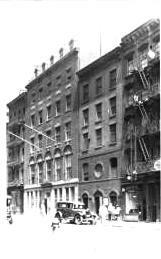 The lot at No.103 Washington Street was purchased in 1799 by Ryneer Suydam who owned a store at 4 Stone Street. Suydam built his three-and-a-half story building with a store about 1812, certainly no later than 1819 as reflected in tax assessments. After Suydam’s death, the building was sold in 1835. Since 1831 it had been a ship chandlery and remained so until 1843. Charles Rowald, who had a grocery business on Front Street, purchased No. 103 Washington, leasing it to other merchants. Rowald moved in for one year, between 1847 and 1848, when he ran an liquor store here. The riverfront area was, at mid-century, a rowdy one and by 1852 the building was an “emigrant boarding house,” and before long a “German dance-house” was operating on the ground floor. The girls who were employed as “dancers” were in fact prostitutes, and rough-edged ones as that. On January 10, 1859 several of the women here were doing their laundry. The task in pre-Civil War days involved scrubbing clothes in vats of scalding water. An ingenious contrivance called an “indigo-bag” was used as a bluing agent. One such bag caused problems at the dance-house. Servant or not, Miss Riddle did not take the action lightly. “Miss Riddle replied by hurling a smoothing iron at the head of Miss Vent,” reported the newspaper. Not to be outdone, Miss Vent proceeded to stab her opponent in the breast with a butcher knife. John Hermann Schutte purchased the building in 1865. Schutte operated boardinghouses catering to the sailors who frequented the riverfront. He enlarged the building by adding two floors in the summer of 1869, creating two apartments on each of the upper three floors. The census of 1870 showed resident families and couples living here—mostly German and Irish immigrants—as well as over 300 transient seamen who would come and go as their ships did. By the time of the tragic argument between the two sailors, the Washington Street neighborhood had become the destination for Syrian immigrants who began arriving in New York around 1880. By the turn of the century the area was known as the Syrian Quarter. In 1899 George Forzly was operating his dry goods and banking business George Forzly & Co., from No. 103. Forzly declared bankruptcy and, between 1905 and 1908 H. & H. Homsy ran its shirtwaist and kimono manufacturing company here. In 1909 the building was nearly lost when a fire broke out in the 4th floor apartment of Mrs. Allie Anderson who worked as a janitress. The woman’s invalid sister, only 14 years old, was home alone and helpless. As the flames worsened, a neighbor Abraham Boyfsal heard Mrs. Anderson’s screams and carried the girl out of the burning building. While the girl was saved, the top three floors of the building were badly damaged. The Syrian community was composed mainly of orthodox Catholics, called Melkites. There was only one Muslim family in the neighborhood in 1904 and a few Jewish families. While the Melkites recognized the primacy of the Pope, they adhered to the Greek Orthodox Byzantine Rite. As early as the 1880s they petitioned the Archbishop of New York to provide a Syrian priest. “We are about 2,000 persons living without a priest and very few of us understand English,” their letter said. 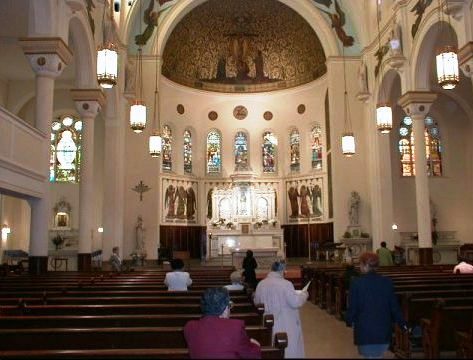 According to Alia Malek in his “A Country Called Amreeka: Arab Roots, American Stories,” the parish of St. George’s Syrian Catholic Church prayed from the basement of St. Peter’s Roman Catholic Church on Barclay until 1916. 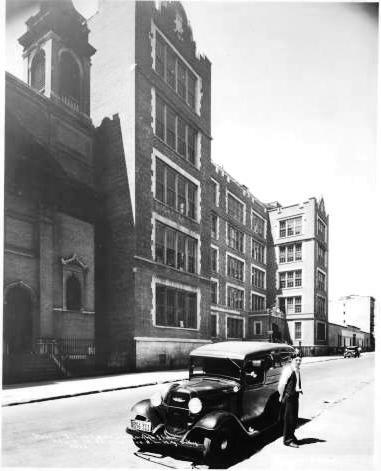 That year they “moved into their own church…at 103 Washington Street.” The parish was apparently renting the building, however, because in June of 1920, George E. Bardwil, who imported high-end linens and embroideries, purchased it for the church. Late that summer, Brooklyn architect W. B. Wills was commissioned to renovate the commercial building into a proper church. In 1921 his work was done. He had gutted the first two floors to create a sanctuary and remodeled the exterior lower two floors with Gothic entrances and what was possibly a small rose window. Above, the façade remained unchanged. Then in 1929 the Syrian World reported that “elaborate improvements are planned for the Greek Melchite church at 103 Washington Street along designs prepared by Harvey Cassab, a Syrian architect of this city” A year later the façade had been transformed into a majestic, terra cotta-clad Gothic Revival stunner. The brilliant white terra cotta, meant to resemble marble, stood in stark contrast to the brown brick commercial buildings along the street. Above the main door a terra cotta relief of St. George slaying the dragon adds a colorful splash to the white façade. Cassab’s emphasis on the verticality of the five-story structure makes is soar skyward and gives it a monumental presence. A vibrantly colorful relief of St. George slaying the dragon replaces the expected stained glass window over the entrance. In 1939 the WPA’s “New York City Guide” described the Syrian Quarter. “Although the fez has given way to the snap-brim, and the narghile has been abandoned for cigarettes, the coffee houses and the tobacco and confectionery shops of the Levantines still remain.” But all that would change. After World War II the Financial District had taken over the Washington Street neighborhood. Many of the small buildings were demolished for skyscrapers and the Syrian neighborhood dissolved. In 1957 the New York Archdiocese saw no reason to have a Syrian priest at the church any longer and assigned a Roman Rite priest. In 1977 the church was finally closed and Chapel Moran, Inc. purchased the building. After over thirty years of preserving the former church, Moran’s Restaurant and Bar left in 2011; possibly late victims of the financial troubles in the area resulting from the disaster on 9/11. Upstairs are apartments. The astonishing Gothic building with its roots planted in 1812 is an arcane gem waiting to be discovered by urban explorers. Napoleon LeBrun achieved the advantageous position as official architect for the New York City Fire Department in 1879. His firm’s name was changed to LeBrun & Sons as his sons joined him in the business. By the time it had completed its last firehouse in 1895, the firm had designed more than 40 structures for the FDNY. A century before function mandated the appearance of firehouses which, by the end of the 20th century were little more than barren concrete garages, the LeBruns created a series of Italian palazzi and French chateaux to house the firemen and trucks. A variety of materials and historic periods inspired their attractive additions to the city’s neighborhoods. An aged fire house was located at 304 West 47th Street for over thirty years when, in 1884, a new station was approved for Engine 54. The cornerstone would not be laid for four years because of delays caused by construction of another firehouse on 67th Street. In 1888 there was a flurry of building for the FDNY and in order to meet the demand LeBrun recycled an existing design. The building was completed in September of 1888. It was a carbon-copy of the firehouses built for Engine Company 15 on Henry Street and for Engine Company 53 at 175 East 104th Street, both completed in 1884. While Engine Company No. 54 did not possess the splashy carved shells of the Italian Renaissance of LeBrun’s Engine 14 or the Loire Valley feel of his Engine 31, it was a masterful interpretation of current popular trends. The architect blended Queen Anne and Romanesque styles, using the red brick of the façade to create a rich textured surface between floors. The capitals of the cast iron, street-level columns featured sunflowers, an element ever-important in the Eastlake movement of the late 1880s and 1890s. Terra cotta ornament and stone courses added to the visual interest. LeBrun deftly melded the proportions and materials of the firehouse with the residential buildings surrounding it. At roll call here on April 7, 1896, Captain William F. Hayes was surprised by the company when the fire fighters presented him with a silver fire trumpet, made by Tiffany & Co. Hayes was celebrating his 30th year with the Fire Department. Firemen at the turn of the century faced a perilous situation when fighting fires. The buildings were illuminated by gas lamps and the flammable material was piped throughout the buildings. When builders saved money by using lead pipe for the gas in the tenement building at 424 West 47th Street, they created a situation that would cost fireman Frank Featherson his life. Featherson, with the rest of Engine 54, responded to the fire that had broken out in the cellar of the building. He was among a handful of men who dragged a hose to the cellar where the smoke was the thickest. The heat from the blaze melted the lead pipe, filling the already suffocating space with poisonous gas. Although an explosion never occurred, Frank Featherson succumbed to the mixture of smoke and gas. Five firefighters were injured when, on June 5, 1906, they responded to a small blaze in a 4-story building two blocks at 503 W 55th Street. The small fire had ignited in a pile of rags at the Boston Steam Scouring and Dyeing Works. As the Engine Company arrived and began unrolling the hose, a powerful explosion blew out the rear and front walls. Sara Bernad, wife of the owner, was blown out of a second story window, her body landing forty feet away from the building. Windows in houses along the street were blown out and the explosion shook buildings as far as four blocks away. The firefighters suffered mostly burns and cuts from the flying glass; however the explosion tossed John McGinnis cross 55th Street. He suffered critical injuries. The handsome firehouse served Engine 54 for almost 90 years. In 1977, after a $2 million renovation of the building, the Puerto Rican Traveling Theatre opened it as a 194-seat theater with proscenium stage. The award-winning group introduces new and important Hispanic contributions to mainstream theater. The PRTT’s sympathetic treatment of the exterior and innovative renovation of the interior are commendable—a praiseworthy recycling of an historic and beautiful property.